Come on Symphogear! You can’t do this to me. I’m not saying you have to make it totally chipper or anything, but let’s be reasonable here! Talk about messing with my heart. The stress this episode created cannot be understated. It is going to be a long week until we see the next episode. If nothing else this episode brought the emotions and had some really surprising elements to it. This didn’t play out as I expected it to. Instead of Saint Germain going down and being betrayed…we had a sacrifice play by Kirika! That’s just something I did not see coming. Sure she had some rough moments with Cagliostro sniping the people she was trying to help evacuate and basically being called happy go lucky. But even while watching the episode I thought that it would simply be a moment of development for Kirika. Not a near suicidal sacrifice! I’m not sure if I’m more proud of Kirika’s preparation or scared that she was willing to make that bold move because she was prepared. Regardless, it was a pretty scary move. She went to extent of loading up on linker and using that to help minimize the backfire from the swan song. The downside of course is that she still has backfire from using the swan song and on top of that the effect of overdosing on Linker. While I don’t think she’s going to die from this…it still isn’t a comforting scene. That is the kind of move you really never want to use. Unfortunately the situation was just that dire. They were out of time from using Ignite and there wasn’t anyone to help out. That was a gutsy move but….geeze not the most comforting one to watch. In the end there was a lot built up into that moment. They did also set it up nicely by having Kirika note in the Shirabe flashback that she doesn’t know her real birthday. It was just made to be the day that she was taken into that facility. Birthdays are something that you can treasure and for some they aren’t a big deal. But I can understand the idea of not knowing when you were born being something that bothers you. It makes sense that for Kirika any birthday is a precious part of a person’s identity. So she wanted to make sure that Hibiki made it back safely with her birthday so close at hand. While Hibiki herself wasn’t that invested since there was a lot at stake, for Kirika it was important. She’ll probably be alright….but it’s not comfortable having to wait to make sure she is. 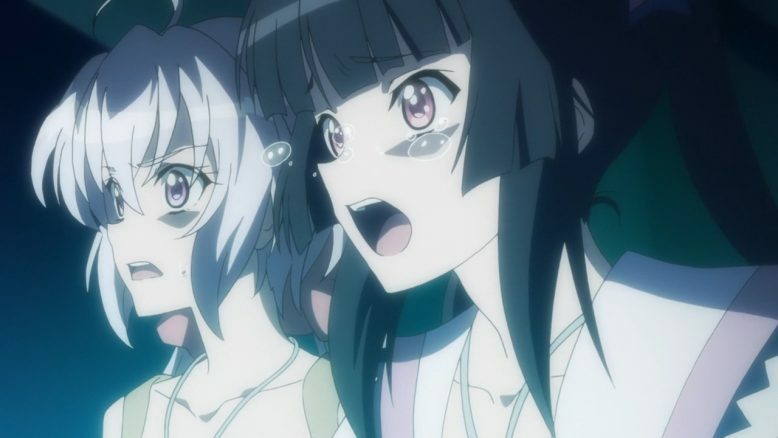 It has been a while since Symphogear really used the cliffhanger bomb to this kind of effectiveness. There wasn’t a point in S3 that I was this stressed about what was going to happen. S2 had some intense moments and S1 definitely did as well. I know some might want blood here and for the show to kill a character off for stakes. But we’re in S4 and I think we’re good to just ride it out with this cast. We’ve had villains die and we’ve had good people die in previous seasons. Isn’t Kanade and Serena dying enough for some people? I really don’t think we literally need to make Shirabe and Tsubasa increasingly similar by killing off both their partners! While I agree that character death can add something to a work, so can keeping them alive. You can’t develop a dead character. Plus we just got Chris back on track. Do we really want her to now have yet another guilt trip as the reason that Kirika is gone? Don’t get me wrong we can do something with that. 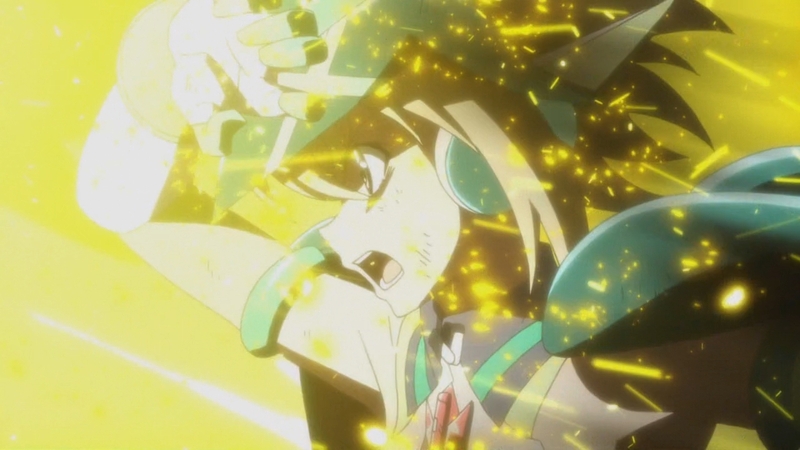 Hibiki’s birthday gets all kinds of dramatic because of it. You have all sorts of things that Shirabe can go with in Season 5. At the same time…I still don’t want Kirika to die here. I think she’s got plenty of room to grow as a character and frankly I just like seeing likable characters alive. Call me crazy if you must. But that’s my personal flaw as a human being. I just want to see Kirika bounce back with an X-Drive revival and you can create some good drama from her near sacrifice going forward into the finale and Season 5. God knows Shirabe will have words for her going forward! 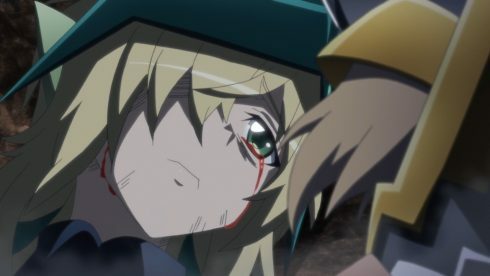 Now to things that aren’t about Kirika’s sacrifice move…I did find it noteworthy how Saint Germain didn’t hesitate about sacrificing herself. Her views are just that extreme. I suppose you can at least say she isn’t a hypocrite. She’ll kill people for her goals. And she keeps track of every life spent on that path. But when it comes down to it she will also kill herself. Even if Adam is a scumbag so long as he’ll follow through with the plan that is enough for her. Of course he won’t actually do that which is a bigger issue. 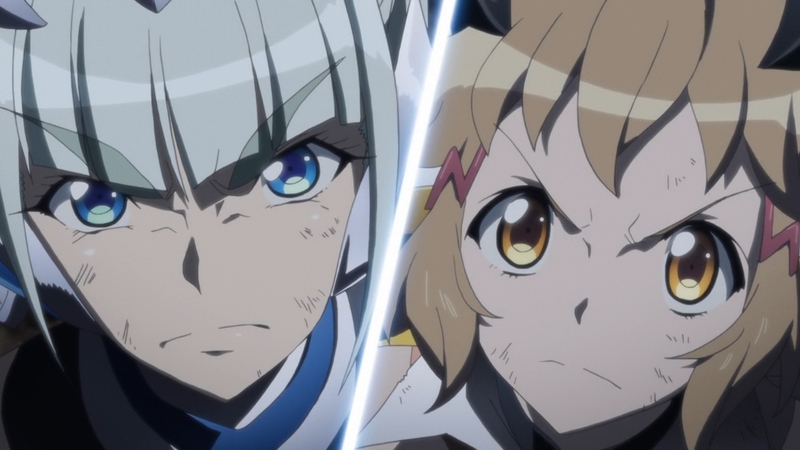 In the end she took Hibiki’s hand and will fight. This is a fairly unusual thing. We’ve had characters change sides in the past. 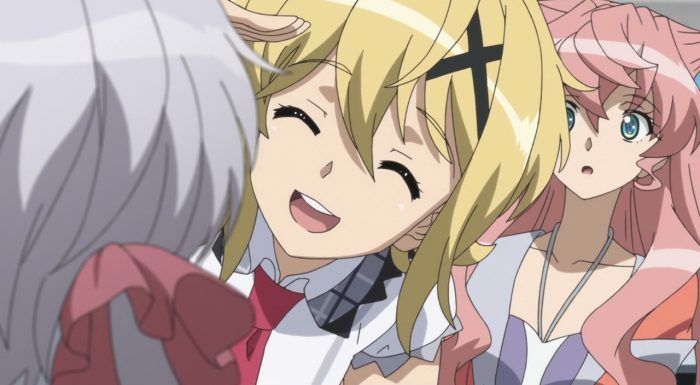 Most of the Symphogear users are characters who were enemies at one point or another. But I didn’t think that would fly with Saint Germain. There is still no certainty that she’s going to survive this, but it is an interesting situation. 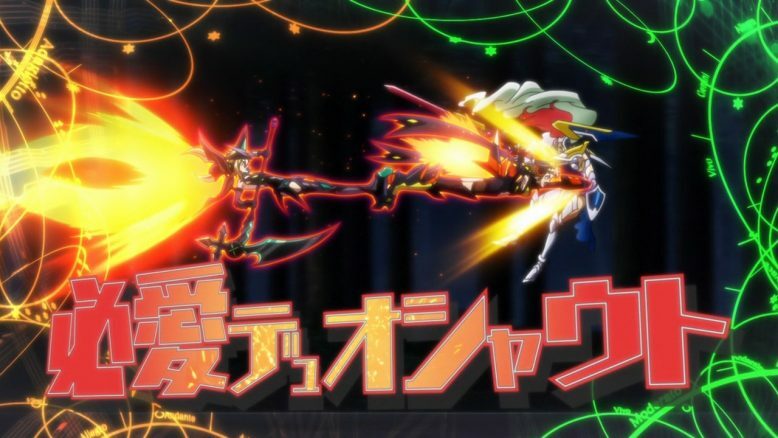 Now we’ve got Hibiki and Saint Germain facing off against Adam. Of course the main point is to stop him. But they also need to keep Kirika safe until backup can arrive and they can get her out of there. Until/if she gets a X-Drive heal they need to focus on getting her medical care in a hurry. But for that to happen they need Hibiki and Saint Germain to hold the line. It is time to see if Saint Germain can avoid sacrificing lives for the sake of her goals. Overall I’d give props to the cast for looking at the big picture. They had a solid enough plan to try and stop Adam. It didn’t totally work, but it did get in the way long enough to basically ‘recruit’ Saint Germain to their side. And they are making a big point with this whole god killer concept. Now I’m not sure if the god killer is Hibiki or just Gungnir. It’s possible that Gungnir is just a really special relic. 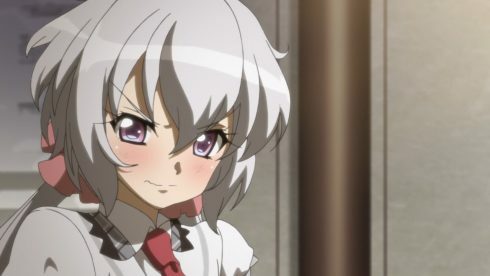 But it is possible that there is something biologically important about Hibiki herself. We know there is something going on there since she killed that divine snake thing back in the first couple episodes. But we don’t really know whether it is special to the gear or the user. We’ll just have to wait and see I suppose.